Craniosacral and Subtle Bodywork for all ages. Cultivate resilience and ignite healing. Partner with the wisdom of your body; the wisdom of nature. Invite transformation and ease into your pregnancy and postpartum time. Welcome your baby into the world with gentle, respectful craniosacral touch. Experience the power of gentle bodywork that addresses all body systems; allowing imbalance to be transformed at it’s source. During these times of big change, experience how bodywork brings ease to the hard work of pregnancy and postpartum. Craniosacral supports babies and children by optimizing nervous system function, supporting healthy development for all ages and stages. I started seeing her when my son was around 9 months old because I was still having some residual anxiety and lots of pain in my lower back. I had a cesarean birth and my scar felt strange and big. I felt like I was in two pieces... it had been hard for me to integrate my experience and feel whole again. After two sessions, anxiety was not an issue anymore and after a few more sessions, my back pain became manageable with simple stretching. Emily radiates a necessary calmness and confidence that balanced my experience in labor. She was the silent ingredient that made my first birth flow without a moment of turbulence. She is a safe haven in which I placed my most important moments as a woman. She has a very special way of relating to mothers. She's so sincere and compassionate and it is clear that she is doing what she loves, with purpose and heart. She is a precious gem in our community! I am so, so, so blessed to have found Emily Rose! I wish I had found her earlier and had her at my birth, but I am so grateful to know her now. She has become a resource for the whole family! I had severe restless legs for over forty years and now they're ninety-five percent gone. I've done many things that have contributed to helping my restless legs but Emily's work was huge and above everything else. After a few sessions, my issues were gone. I wish I met her a long time ago. I highly recommend Emily. Sajan is doing so much better! Since your visit, he has gotten much better at tummy time and stronger overall. He holds his head up frequently and just doesn't seem as stiff. He also has more movement. Your tips & resources & the therapy of course were all very helpful, thank you! My first few weeks postpartum were very difficult because my baby and I were having trouble nursing. I felt hopeless and distraught until I was referred to Emily. After three sessions she was nursing like a champ! I now have a wonderful breastfeeding relationship with my baby girl and am so thankful for the Craniosacral Therapy and for Emily for her support! EMILY! You made our vision a reality. I truly mean it when I say I couldn't have done it without you. I know I would not have been as strong if you hadn't been there with me, guiding both me and my partner, and problem solving for me. You were an awesome partner. Thank you for taking care of me. Thank you for all your knowledge and intuition. 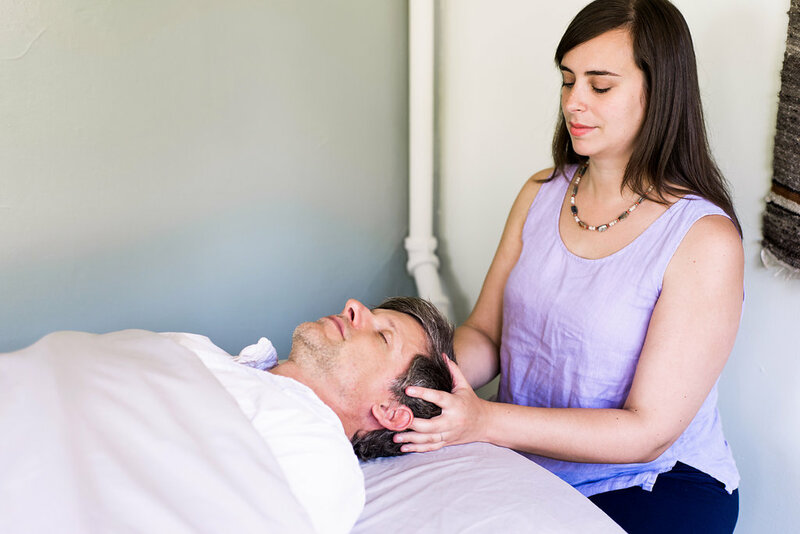 If you're looking for a Craniosacral practitioner, look no further, Emily is a gifted, skillful healer who incorporates intuitive insights along with her hands on healing to give a full spectrum of healing modalities. I've worked with many healing practitioners who promised success but never delivered. Emily gave no promises but delivered the goods. She has done wonders with me.